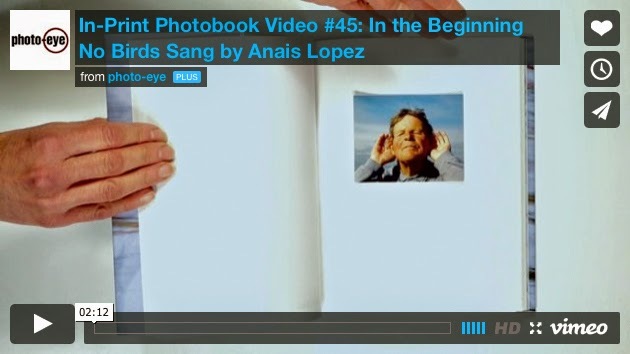 Video In-Print Photobook Video #45: In the Beginning No Birds Sang By Anais Lopez With Melanie McWhorter Melanie McWhorter presents Anais Lopez's In the Beginning No Birds Sang in #45 of our in-print photo book video series. In video #45 of our In-Print Photobook series, Melanie McWhorter shares with us In the Beginning No Bird Sang self-published by Anais Lopez. Melanie McWhorter has managed photo-eye's Book Division for 16 years and is a regular contributor to the photo-eye Blog. She has been interviewed about photography in numerous print and online publications including PDN, The Picture Show and LayFlat, has judged the prestigious photography competitions Women Photojournalists of Washington's Annual Exhibition and Fotografia: Fotofestival di Roma's Book Prize, has reviewed portfolios at Fotografia, Photolucida, Review Santa Fe and PhotoNOLA, and taught and lectured at numerous venues.